The Bay Laurel tree, also known as the Bay Leaf tree, true Laurel, and Grecian Laurel, is part of the genus Laurus. The small evergreen is a hardy specimen which features a multitude of uses. In addition to being an attractive specimen, the tree's fragrant leaves are coveted by cooks who use them as an herb in a variety of recipes. 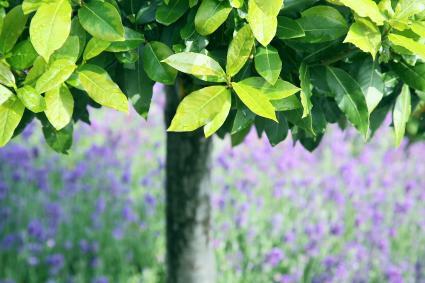 Landscapers also treasure the tree for its manageable size and low maintenance. Bay Laurels are easy to spot thanks to their pyramidal shape. While the tree is capable of growing to 60 feet, it is typically pruned to form a much smaller hedge or topiary. Bark: The tree's shiny gray bark dulls with age. 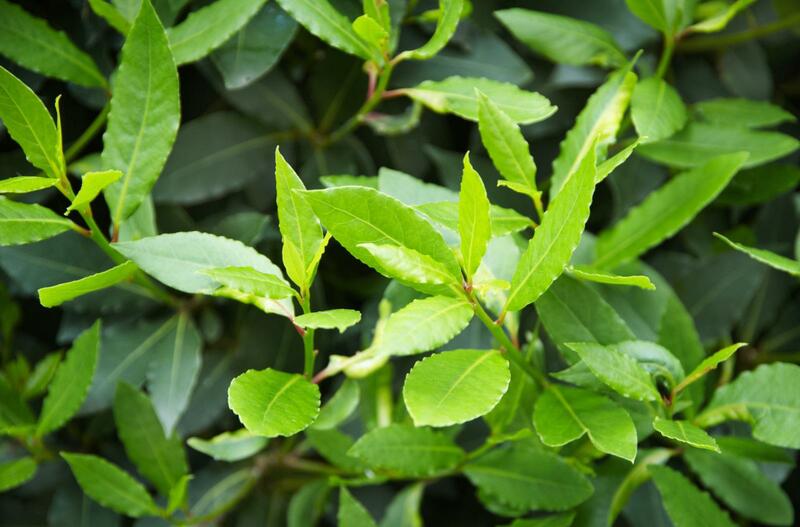 Leaves: The shiny green aromatic leaves are thick and leathery. The lance-shaped leaves can be harvested and used in recipes once the tree marks its second growing season. Flowers: Multiple clusters of tiny white and yellow flowers are produced in spring. Fruit: Small glossy black or purple berries appear once the flowers fall. Bay Laurel trees are among the oldest specimens in the world. Despite its age, the tree remains as popular as ever, showing up in formal and royal gardens on all four corners of the planet. Laurus azorica: Commonly known as Azores Laurel, its shiny dark leaves are not edible, though its creamy white flowers are very fragrant. Laurus novocanariensis: Known for its leathery, deep green leaves, the shrub-like bush bears olive-shaped fruit. The slow-growing species needs consistent pruning if it is to be kept to a manageable height. While the Bay Laurel can survive warm weather, it needs adequate water to prosper. The tree thrives when it is frequently watered in well-drained soil and exposed to full sunlight. It does not grow well in regions that experience cold winters or high winds. Most people plant Bay Laurel trees in herb gardens, though others use the tree as a privacy screen by cultivating a series of specimens in a single row. 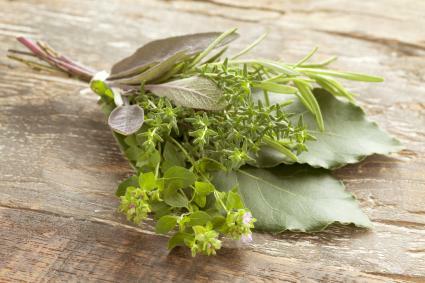 The leaves are also an essential ingredient in what the French call a "Bouquet Garni," which is basically an herb bundle that also includes other herbs such as parsley and thyme. Bay leaves can be used fresh or dried, though they should be removed from recipes before serving and should never be eaten raw as the sharp edges can cut a person's mouth or throat. The tree's berries are also used for a variety of medicinal purposes. 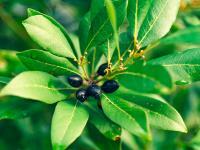 In most cases, the oil from the berries is extracted and consumed to relieve stomach ailments, including flatulence. 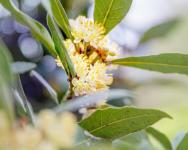 Pressed oil from the Bay Laurel's berries is also used in perfumes, candles and soap. The Bay Laurel tree is deeply rooted in Greek and Roman mythology. This association is clearly seen in the story in which the nymph, Daphne, is transformed into a Laurel tree by her father, Peneus, so that she could avoid the advances of Apollo. To show his undying love for Daphne, Apollo donned a wreath of Laurel on his head for all of eternity. To this day, the Laurel has symbolized success and status. In some cultures the tree is credited with having magical powers to ward off evils and atrocities. 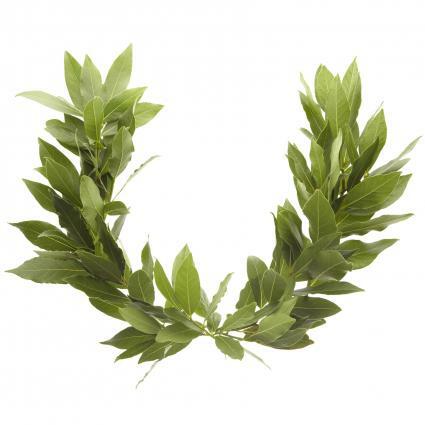 In ancient Rome, the Laurel symbolizes victory and is the source of the word "baccalaureate." Christians believe that the Laurel symbolizes Jesus' resurrection. Chinese folklore states that there is a great Laurel tree growing on the moon, which is why the Chinese name for Laurel translates to "moon-laurel." Root Rot: This fungal infection can attack the tree if it is exposed to excess water over a long period of time. Symptoms include mold, mildew and premature leaf drop. Powdery Mildew: This fungal disease typically presents itself on branches that do not get enough sunlight. The white mildew spores form on leaves and can spread to twig and branches if left untreated. Anthracnose: Symptoms of this fungal infection include sunken, gray, spongy patches on leaves and branches that eventually develop spore masses. In severe cases the disease can spread and the tree can die. In addition to these diseases, insects also prey on the Bay Laurel. Sapsuckers are especially fond of the tree and cause leaves to discolor and fall prematurely. Plant the Bay Laurel in the early fall or mid-spring. Select a site that is exposed to full sunlight. Add compost to the well-drained soil and water generously for the first growing season, especially if drought conditions persist. Add fertilizer to the base of the tree in the spring. Finally, it is necessary to prune the Bay Laurel tree in the spring in order to maintain its shape and size. Trimming is also a good idea to allow sunlight to reach the center of the tree. Historically the bay laurel tree is a valuable plant that has medicinal, ceremonial, health and even magical uses. The most common modern use is using bay leaves in cooking recipes.